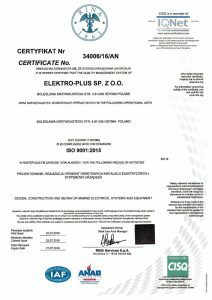 During summer 2016 we had passed RINA audit for ISO9001:2015 certificate. After a three day audit we were given a green light and we can now be proud that our work meets requirements of RINA. Also work is always performed with accordance to the requirements of classification society, and under supervison of class inspector. 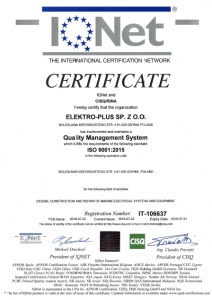 Our internal quality standards help us deliver best quality products and services. Many of our employees are trained at various training centers – thanks to that we always have possibility to deliver best servicemen for your particular needs. Our serviceman were trained in Kongsberg in DP mainterance, we employ Electro-Technical Officers to attend Glomar Offshore ships. We have Sonardyne USBL operators with knowledge how to service HPR systems. Every one of us has the required training to be able to work with electric systems on seagoing vessels. Not to mention that we attended to Littlefuse, Cubic, ABB, Mitsubishi training centers. Additionaly, our workshop is approved by RINA to carry out jobs for this society.